Smoke alarms are an invaluable component in home protection and fire safety, alerting families the moment the slightest waft of smoke drifts across their sensors. Those sensitive systems, however, can also create a state of perpetual frustration when, without an obvious cause, the beeping begins and seems to never end. There may be variances in equipment, so consult the owner's manual if available. Most smoke alarms generally emit two types of beeps, although in some cases if the unit has reached the end of its life span, it may beep in a unique pattern. Check the user manual (usually available online) if the beep pattern is more distinct. When smoke is present, many alarms transmit a continuous loud beep without breaks. The alarm may sound similar to a siren and deliver an unmistakable message of urgency. If the beeping is a shorter chirping sound with intermittent breaks, it is possible the cause may be something other than smoke or fire. The solution could be as simple as changing a low battery. Each scenario is unique, but the following steps offer a few handy tips for resolving the most common causes of the incessant beep of a temperamental smoke alarm. Replace the used battery with a new battery of high quality. Avoid using re-chargeable batteries, as the varying battery-life could impact the time between battery changes significantly. The general recommendation is to change the battery approximately every six months. One easy rule of thumb to remember: Change the smoke alarm battery when changing clocks for Daylight Savings Time (spring and fall). 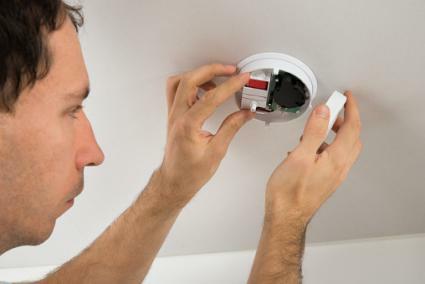 If the smoke detector is still beeping, verify the new battery has been installed correctly by checking the positive and negative posts on the battery and the smoke alarm. Match positive (+) to positive and negative (-) to negative. Still beeping? Inspect the alarm to make certain it is not dirty. It is not uncommon for dust to collect inside the smoke alarm. In fact, some ceiling substances can flake off occasionally and accumulate within the smoke alarm or battery compartment. Before attempting to clean the smoke alarm, remove the battery and turn off any electricity going into the unit. Wipe any obvious debris away with a clean, dry cloth. Gently blow loose dust away with soft, quick puffs of air from a can. Be careful not to cause any damage to the alarm components inside. Significant temperature increases can activate recurrent beeping in smoke detectors. Ovens and steamy showers are often repeat offenders, generating frequent false alarms. Take practical steps to manage noticeable changes in temperature. If possible, open windows when baking and use exhaust fans when showering to eliminate excessive steam. Ionization smoke detectors are especially sensitive to fluctuations in air temperature, so homeowners using an ionization model may conclude that a photoelectric smoke detector is a better option. If all reasonable efforts to manage temperature changes are ineffective, consider changing the location of the smoke alarm to an area where the air temperature is more consistent. Sometimes the test button may be pushed by mistake, especially when cleaning around the unit. The test button is designed to help you know your detector is working by pushing and holding it so the unit can emit a loud alert pattern. If you push and release the test button quickly or bump it by mistake, it could trigger the unit to relay that something isn't right and start the beeping. Disconnect the power source by removing the battery. For hard-wired units, turn off the main breaker, as well. Press and hold the test button for approximately 15 seconds. After the brief alarm, release the test button and replace the battery. For hard-wired detectors, reconnect power (turn the breaker on). Most hard-wired units have a battery back-up, but some may beep due to electrical problems. The breaker may have been tripped, or there may be a loose wire. If the issue is wiring, its best to contact a certified electrician for inspection and repair. Smoke detectors have a life span of five to ten years. If this is the problem, the beeps will likely present in a specific chirping pattern. Inspect the unit carefully and find the expiration date. If the smoke alarm is beyond that date, it's probably time to buy a new one. If the above actions have failed, it may be time to consult the manufacturer. Look on their website or call the customer service line to find out if there are any product recalls. If the unit in question doubles as a CO2 detector, check carbon monoxide levels in the home. The local fire department may be able to assist and likely has a non-emergency number. If occupants are experiencing symptoms of carbon monoxide poisoning, call 911. Whether the issue is an easy fix or a more intensive effort, try to resolve the dilemma quickly. Not only will peace and quiet return, but you'll rest in the security of a safe and protected home again.